Item number 08.491.8802 from the Brooklyn Museum. 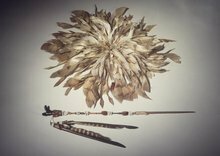 Plume stick consisting of a wooden handle and two feathers attached to the handle by two cords of white beads.This pin would be stuck into the bunch of owl feathers (08.491.8807). These items are part of the feathered headgear stuck into a hairnet and tied at the back of a dancer's head.